Initiated by Martyn Drage, the event welcomed high-profile guests from the field of financial services (Eddie Stobart, FCA Throgmorton Trust PLC and Lloyds Banking Group), energy (Chris Finlayson, the CEO of BG Group, unfortunately could not attend but was represented by his colleague), software and telecoms (Ian Taylor, CFO of Quortus Ltd.) and pharmaceuticals (Dr Peter Cozens, Partner, Propharma Partners). The panel was completed by Heather McLaughlin, a Master World Trader, and Professor John Board, the dean of Henley Business School. In a very open environment the leaders were discussing issues relevant to their industries and presented their outlooks for the future of Britain’s industries. 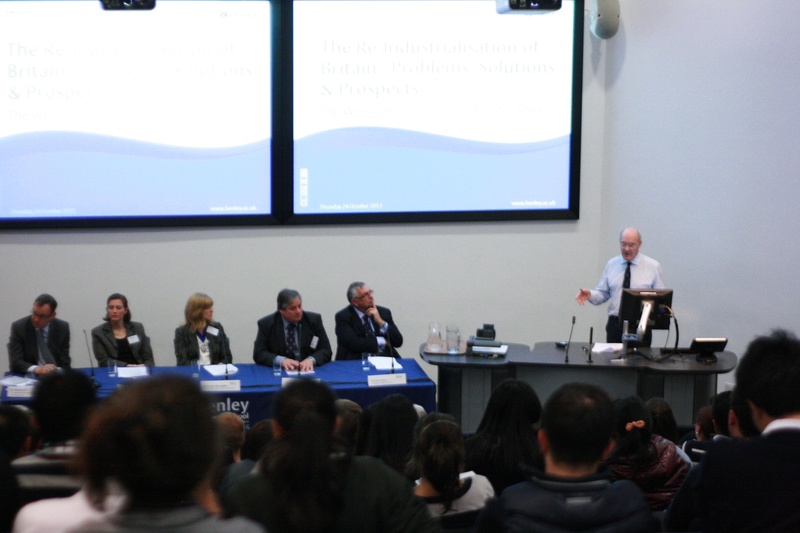 In the following panel discussion, the audience, which consisted of students from Henley Business School and members of World Traders, could raise issues regarding the re-industrialisation of Britain. After the panel discussion, students had the chance to talk and network with the World Traders in the ICMA Centre’s bar and discuss relevant issues further. All in all, everyone enjoyed this great event and made use of the opportunity to talk to the leaders. Previous Post How good a picture can Euro GC Pooling provide of the interbank euro GC repo market?